Babawowo – fashion match your kid with your dog! If you’re a person with four legged and two legged babies, we’ve got something for you! 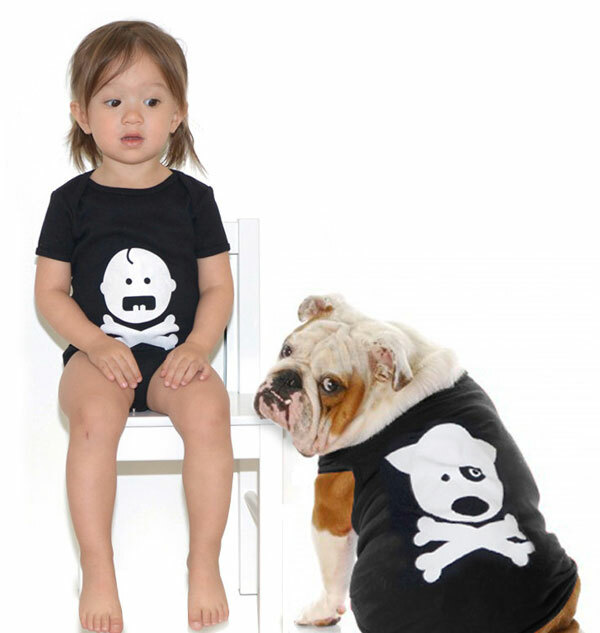 Indeed, it’s a little odd but what a fantastic novelty gift this onesie and dog tee set from Babawowo makes. Coordinate your human baby with your fur baby nicely with these fashionable pairings that take twin dressing to a surreal new level. Children’s pants, onesies and dog tees come as sets for US$40 but can also be purchased separately in the event your pet beagle refuses to wear something. Clothing is designed to fit babies from three months to twenty-four months and dog tees are available in small through to extra large sizing. Designs include a great conversation starter in Waah/Woof pictured above, the black and white Secret Society set pictured below and the delightful Milk Bone. Guaranteed a few laughs at a baby shower would be the Big Brother Dog Tee (US$20), perfect for the expectant mum whose first baby was of the canine variety! Check out the collection of child and puppy duos available at Babawowo on Etsy.